Our final day at the school was really long, but wonderful. On the second day, not as many people were there and of the kids who were there the girls were more interested in tying bottles while the boys were more interested in kicking the soccer ball. Today, however, the whole community was back at the school and the boys really joined in the school building process. Our jobs today included covering any exposed chicken wire that the bottles didn’t cover with trash and sifting sand to make concrete to cover the bottles. Of course the girls continued to help, but the boys really took to both these tasks. 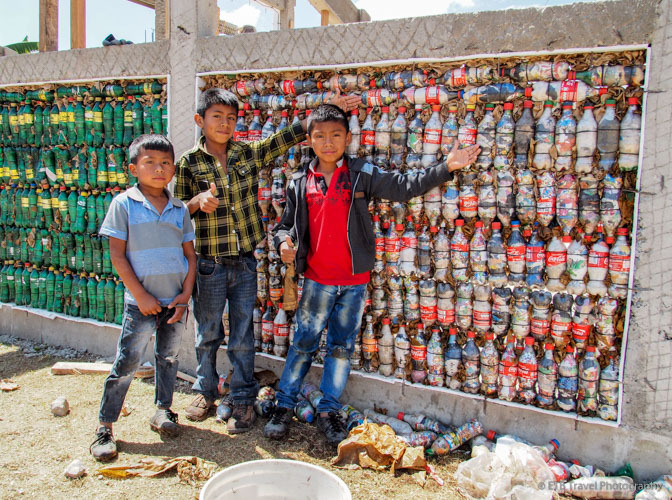 Their fast little fingers were perfect for fitting trash in the small crevices between the bottles and into the chicken wire. Even the teenage boys who were too cool to help but quietly watched the project unfold all week from the corners of the school courtyard placed paper in the chicken wire. trash between the bottles is complete! After a morning of working with trash, I joined the sand sifting process for the afternoon. Others finished tying bottles onto the upper part of the school once the rest of the chicken wire was secured into place. They succeeded in filling all the chicken wire on the school with a bottle! The sand sifting process was a simple, though tiring task. It simply required shoveling sand into a screened boxed that we shook over a wheelbarrow to separate any rocks from the sand. Then we made a new pile of sand by the school that would be mixed with cement to be splattered on the bottles at a later date. The sun was hot in the afternoon, but it didn’t stop the 5-7 year old kids from shoveling and sifting. At times they sifted sand on their own while we took breaks. They loved pushing the dilapidated wheelbarrows to the sand pile as well as riding in them. When they weren’t shoveling, sifting, and pushing and riding in the wheelbarrows, they were asking to take photos with my camera! Five-year old Alex needed a little help with his photo taking abilities (though the camera was about as big as him). On the other hand, Misael turned out to be a budding photographer as he directed people together for a snapshot! Along with the little boys, there was one little girl, Corrina, shoveling away. By the end of the day, I was pretty exhausted and seeked shade by our water table (mind you the kids had yet to drink an ounce of water). Little Corrina followed me over to the table, stood staring at me and questioned, “Trabaja (work)?” In my broken Spanish I said I needed 15 minutes to rest. As I sat in the shade drinking some water, she remained standing there, still staring, and about two minutes later she repeated, “Trabaja? I couldn’t keep saying no, so I bought an extra minute or two by saying I needed to put my camera up in the room where we stored our items, and then I was back at the sand pile. Fortunately for me it was near the end of the day, and the masonry men started putting up the shovels and wheelbarrows. I was spared from working more in the hot sun, and instead got to enjoy the final games that were planned for our farewell. We started out with musical chairs, moved on to the sack race, and ended with the three-legged race. What fun! We ended the day with a question and answer session as well as another ceremony. In the question and answer session both the community (the kids) and the volunteers got to ask each other questions. Someone in our group asked what the kids liked to do in their spare time. Most answered, “work”. Andres our translator tried giving them other ideas like color and play soccer, but most of them don’t have free time. They go to school from 7:30 to 2 and go home to collect water, cut fire wood, do laundry, and work in the fields. One girl walks an hour to school and an hour home every day. When we asked what they wanted to do when they grew up, many again answered, “work”. After Andres gave some other examples, a few provided more specific aspirations including being doctors, singers, a masonry, a policeman, a professional tortilla maker, and a model. The ceremonies were next. Our group was invited on stage, and each of us was presented with a small vase. Next, we were treated to more dance entertainment just as in our welcoming ceremony. One dance expressed how they make coffee, but the most hysterical dance was the final gorilla dance when they grunted, huh, huh, huh in a deep voice as they swung there arms forward with each grunt. It was so cute! The final farewell included the mayor speaking to us as a band played. To put the event into perspective for the community, there are no sporting events or concerts or anything else for that matter. Our arrival was a big deal! We were the first gringos to visit their town. We have impacted their lives just as they have impacted ours. It’s hard to leave and never know what will happen to them as they don’t even have a post office for communication. I’m hoping I can somehow communicate through Facebook with the principal who spearheaded the town’s project. In a few more months they will have two more class rooms and by the beginning of the next school year two more teachers! While it’s not much, it is a start and everyone’s lives (theirs and ours) will be changed forever. Along with the many touching moments I’ve mentioned in my previous posts, two more stuck with me today. I spent a lot of time with 7-year old Misael, and in order to make conversation in my limited Spanish, I asked questions with the words I knew. So I asked, Quién es tu mejor amigo? (Who is your best friend). I thought maybe he would say Isaiah as they spent a lot a time with each other, but without skipping a beat, he answered, “Todos” (everyone). To me this embodied the love of this tight-knit community. The other touching moment took place when we boarded the bus to leave. Many in the community came to the edge of the school courtyard where the buses were parked to wave good-bye. One person on our trip was a 13-year old girl named Ella who was adopted from Guatemala as a baby. She made friends with the girls her age from the community that were at least a foot shorter due to the lack of nutrition in their staple food, corn. These young girls, who truly have nothing, came to the bus gave Ella their earrings, their necklace and wrote her heart-warming notes including one that said in Spanish, “Please don’t forget me.” Of course, Ella and her mom gave them many things as well, but I have to say their actions choked me up.